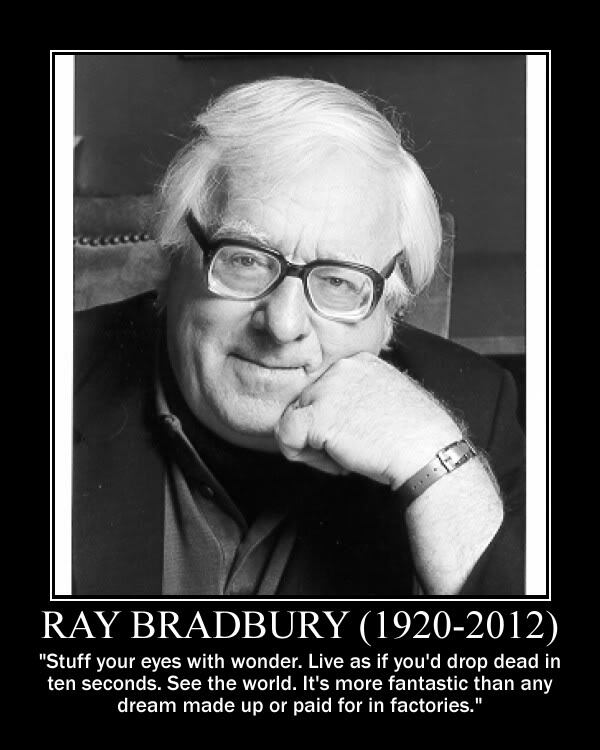 Ray Bradbury wrote complex cautionary tales about society and morality, disguised as science fiction. Though many of his most influential works are now decades old, the lessons and warnings within are timeless. Today, on what would have been his ninety-second birthday, we honour one of the twentieth century’s finest thinkers by highlighting the top life lessons he left for us. Colloquially known as the “death and taxes” rule, the idea that some inevitabilities in life just cannot be avoided is not unique to Ray Bradbury but is still a common theme throughout his work. A fixation on the fear of death features prominently in Dandelion Wine and Something Wicked This Way Comes and is the main catalyst for action in both novels. This fear leads the novels’ characters to close off emotionally and even take drastic and selfish measures in their attempts to outsmart mortality. It is only when they relinquish this fear of the unknown that they are able to live their lives to the fullest. Though no person wants to feel vulnerable or powerless, it is an inescapable fact that during our lives we will be faced with situations out of our control. Fear is only as powerful as your mind allows it to be and accepting aspects of life that are beyond your control is the key to achieving true happiness and your full potential. 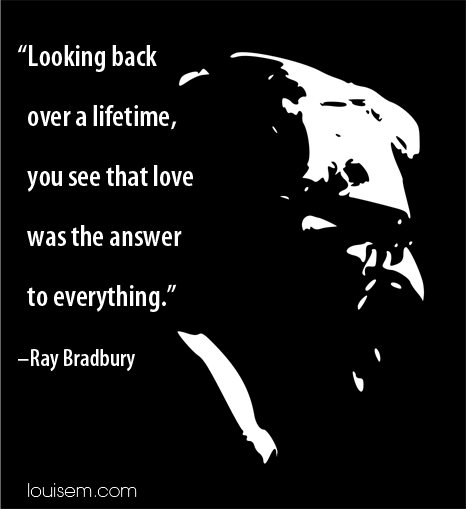 Ray Bradbury was a family man, having married and made his life with the only woman he ever dated, so it is no surprise that his romanticism and loyalty shone through in his writing. Two short stories from the book The Illustrated Man highlight the importance of human connections in leading a healthy life. In “The Rocket Man,” an astronaut struggles between a selfish desire to explore the stars on his own and the practical need of keeping his young family together. After years of going back and forth between Earth and space, he opts to take one more solo trip despite his wife falling apart in his absence. On this trip, however, he flies too close to the sun and dies, ruining his own life and those of his widow and young son, as well. In the second story, “The Rocket,” the father works his whole life to be able to afford a trip to outer space but still has only enough money to send one member of his family. Not wanting to break his family apart, he opts instead to spend his hard-earned money on building a replica spaceship they all can enjoy. Both men were faced with the opportunity to keep their family together by sacrificing the chance for space flight, but only the father who put his family first survived. For Bradbury, the idea that self-centred desires are the base of human unhappiness connects to his belief that accepting your own limitations and enthusiastically pursuing the everyday joys in your life is always the right choice. The idea that dependence on technology is a direct route to a dehumanised society is prevalent across Ray Bradbury’s body of work. From the colonisers of The Martian Chronicles blindly refusing to learn from past mistakes, to the husbands of “Marionettes, Inc” (in The Illustrated Man) being driven from their own homes by the companion robots they bought for their wives, the loss of humanity due to an unquestioning dependence on technology is the downfall for many Bradbury characters. In no book is the importance of “a life of the mind” so central to the story as in his best-known work, Fahrenheit 451. Ray Bradbury was acutely aware that human society can easily become oppressive and regimented, and he saw censorship by the government as the first step towards totalitarianism. In Fahrenheit 451 the government has gained complete control over the masses by encouraging the fast-paced pursuit of material goods, especially music, television shows and advertisements that are too loud (visually and aurally) for the mind to focus on anything else. With books becoming too overwhelming to think about, let alone read, the government takes its next step with ease and burns all written material. The effortless progression of government oppression in Fahrenheit 451 continues to serve as a reminder of the importance of individualism and questioning political agendas. The ability to reason is what sets humans apart from animals and technology; we must not squander this evolutionary advantage! 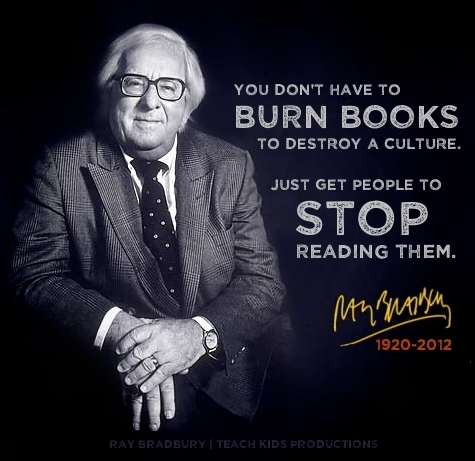 What is your favourite novel or short story by Ray Bradbury? How have the lessons of his works influenced your life? Thank you, Ray. You are and always will be The Rocket Man. ‘Being Tall’ was easy for you. We are fortunate that you shared your vision with mankind. Thank you again for lessons to Alpha Centauri that reach far beyond the grasp of iconic imagery so beautifully painted onto The Sistine Chapel ceiling.